The SanDisk 32GB 1067x Extreme PRO Compact Flash Memory Card features UDMA 7 technology and boosts data transfer rate of up to 160MB/s. This makes it excellent for high-speed burst photography, with better shot-to-shot performance. 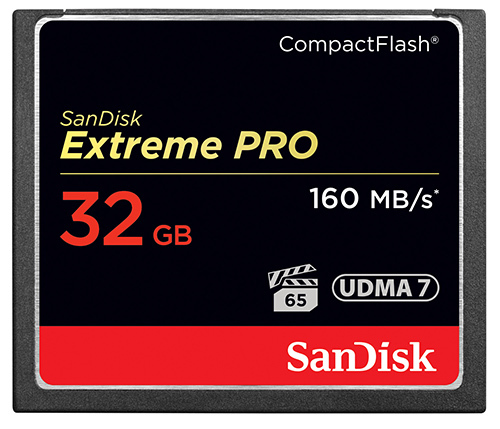 The SanDisk Extreme PRO Compact Flash cards have been designed for optimum performance in high-end DSLR cameras and professional video cameras. The cards support the Video Performance Guarantee (VPG-65) which means they are capable of a minimum sustained write speed of 65MB/s for perfect capture of 1080p, 3D and even high-end 4K video, without dropping a frame. The SanDisk Extreme PRO CompactFlash Memory Card can operate in temperatures ranging from -25ºC to 85ºC, so you can record rich Full HD video or snap the perfect shot in almost any climate. These cards are tested with rigorous stress, shock, and vibration procedures and feature RTV silicone coating for added protection against shock and vibration. The SanDisk Extreme PRO CompactFlash Memory Card comes with a one-year subscription of RescuePRO® recovery software. RescuePRO software makes it easy to recover deleted photos or videos and save them to your computer's hard drive - even if the files were deleted months ago (recovery of files cannot be 100% guaranteed).